Life is good is a New England-based apparel and accessories brand that was founded by Bert and John Jacobs in 1994. They are best known for their optimistic T-Shirts, which feature a smiling stick figure named Jake and the registered trademark “Life is good. In addition to selling t-shirts and accessories, Life is good is a brand whose purpose is to have a positive impact on culture and society. Life is good is devoted to spreading the power of optimism and helping kids in need. The brand’s positive purpose is to donate 10% of profit to kids in need. The brand has raised more than $9 million so far for kids in need, with much of the money used to support education and child care. In 1989, Bert and John Jacobs designed their first tee-shirt. At the time, they knew very little about business. For five years, the brother sold tee shirts in Boston and traveled the East Coast, selling door-to-door in college dormitories. They lived on peanut butter and jelly, slept in their van and showered when they could. It was truly a glamorous existence. Along the way, they had fun, but didn’t make much money. By 1994, they were searching for answers to keep their dream and business alive. They found their answer. Hanging on their wall in their Boston apartment was a drawing of Jake. Jake’s contagious grin seemed to express everything the Jacobs brother believed in. In September, they printed up 48 Jake shirts for a local street fair in Cambridge, Massachusetts. They laid the shirts out on a table and by noontime, all 48 of those shirts were sold. As they say, the rest is history. 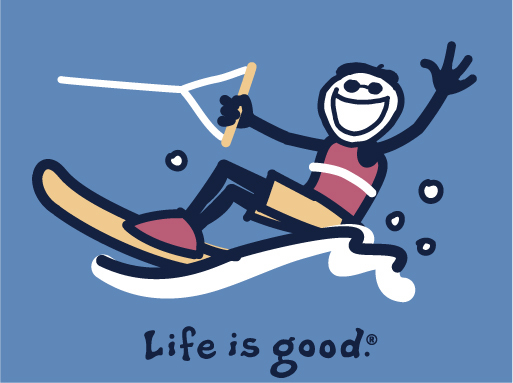 Today, Life is good has estimated sales revenue of $100 million. Life is good is now a global brand. Life is good recently announced a partnership with Hallmark to distribute products and create co-branded merchandise. Today, the brand stays close to its roots, with an emphasis on simplicity, humor, humility and optimism. In 2003, the brand launched the Life is good festival as an annual music and arts fundraising event in Boston for kids in need. The brand plans to continue to focus on helping kids. It helps unify employees at company in support of a bigger purpose. This is a great brand story, spread optimism and help kids. Do you own a Life is good t-shirt?